MainAll NewsInside IsraelKahane's Grandson Arrested; 'Long-Term' Arrest? Kahane's Grandson Arrested; 'Long-Term' Arrest? Ettinger, a grandson of the late Rabbi Meir Kahane, was arrested in Tzfat (Safed), where he has been living for the past several months, after he was banned earlier this year from living in Judea and Samaria for 12 months, suspected of assisting in preventing the demolition of new communities (outposts) by the IDF. He has also been banned from entering Jerusalem for six months; that order is due to expire in November. Officials did not say if he was being questioned in connection with Friday's arson in Duma, but sources said that questioning Ettinger was "important" to solving the case, Channel One reported. The security cabinet voted Sunday night to allow use of administrative detention against Israelis, and Ya'alon said that he was prepared to use it immediately. An investigation will, he said, sooner rather than later point a finger at suspects in the Duma arson, and Ya'alon said he would not hesitate to use the tool to detain suspects, even if there is not sufficient evidence to hold them through normal legal channels. The administrative detention law requires security officials to conduct thorough investigations and to report on their progress in court every three months. With that, the law is open-ended, and allows officials to keep individuals in prison as long as required. According to government statistics, Palestinian terrorists who have been arrested and detained under the law are usually detained for between six months and a year before being either released or charged. Defense Minister Moshe Ya'alon said Monday that the government would not hesitate to jail Israelis under those conditions. “We will use [administrative detention] in cases where it is clear that individuals are involved in terror, but we do not have the evidence to arrest them,” he said at a press conference Monday. 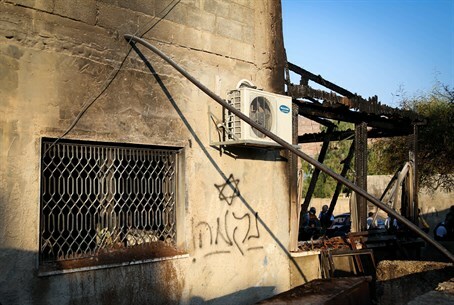 Ya'alon said that he was aware that the tool of administrative detention was a harsh – and controversial – one, but the events of recent days, especially the arson at the Arab village of Duma, left Israel with no choice. “This will be one of the more drastic tools that we can employ to fight Jewish terror, but it will be used if necessary in order to bring terrorists to justice and defend Israeli democracy,” he said.